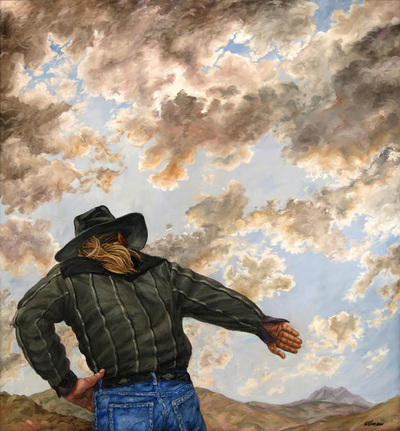 Delmas Howe was born in El Paso, Texas in 1935 and raised in Truth or Consequences. After graduation from high school he did his undergraduate work at Wichita State University, then four years in the US Air Force, graduate work at Yale University and several years of classes in NYC at the Art Students' League and the School of the Visual Arts while working as a professional musician. After running a successful design studio in Amarillo, Texas, he returned to Truth or Consequences. Delmas Howe is one of nine recipients of New Mexico 2006 Governor's Awards for Excellence in the Arts. The Albuquerque Museum of Art and History acquired in 2010 "The Three Graces" a 1978 oil painting by Howe, on display for the public in 2011. The NM Museum of Santa Fe and the NM Capitol Arts Foundation Collection house his lithographs. Howe is also a part of the Board of Directors of the NM Capital Arts Foundation Collection.